The month of March will be filled with musical performances, as Salem College presents a month-long series of recitals performed by some of Winston-Salem’s most notable organists. 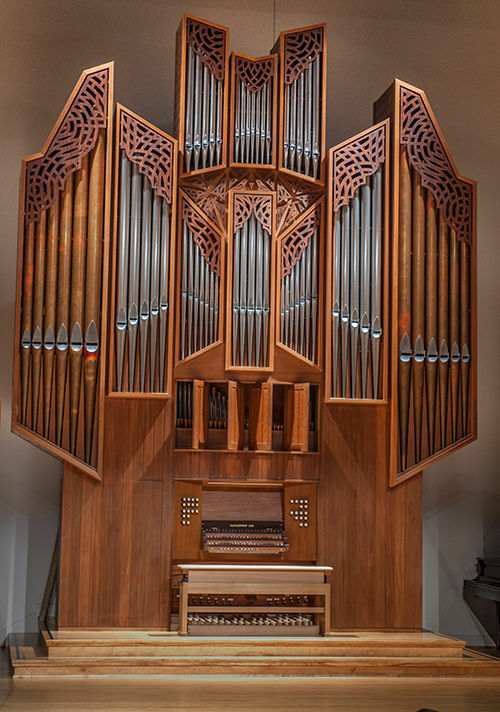 Celebrating the fiftieth anniversary of the historical Flentrop organ, the Salem College School of Music will host thirty-minute lunchtime recitals. Each recital will begin at 12:15 pm in Shirley Recital Hall at the Elberson Fine Arts Center. Wednesday, March 4Susan Bates has served as Organist and Music Associate at Centenary United Methodist Church since March 2011, with previous appointments at West Market St. United Methodist Church in Greensboro and at Home Moravian Church. She studied under John and Margaret Mueller, Margaret and Clemens Sandresky, Nancy Wurtele, and Joan and Eugene Jacobowsky at Salem College, before completing graduate work at Yale University. Susan serves on the music faculties of Wake Forest University, Greensboro College, and High Point University. Wednesday, March 11Thomas Baugh is Director of Music at Christ Episcopal Church in Roanoke, VA. He received the Master of Music degree from Westminster Choir College and studied organ with John Mueller, Bruce Stevens, Gerre Hancock, and Louis Robilliard. His CD recording, played on the Fisk Organ at Christ Church, called French Éclat in the Roanoke Valley, is available from Raven Recordings. Wednesday, March 18Mary Lou Kapp Peeples earned her music degrees at Salem College and at the Eastman School of Music, where she studied with Margaret and John Mueller and Russell Sanders. She has performed numerous recitals in the United States and in France, including a recital at St. Thomas Church, Fifth Avenue in New York. Her performances have aired on National Public Radio and on Alabama and North Carolina Public Radio. Wednesday, March 25Mary Louise Baker holds a Bachelor of Music Degree in Organ Performance from Salem College, where she studied with Jack Mitchener and Barbara Lister-Sink. While she was at Salem, she was an A.J. Fletcher Scholar, a Junior Marshall, and the recipient of the President’s Prize in 1999. Baker earned the Master of Music Degree in Organ Performance & Literature from the University of Notre Dame, where she studied with Craig Cramer. She has served as children's choir music director at First United Methodist Church in Laurinburg, NC, for the past seven years.